1. Beginning. Beginning is generally a very strange thing because to reach the very beginning is almost impossible as it is impossible to reach the very end. Now we can only guess that before the beginning there was either Everything or Nothing but Something happened and that was the beginning. 2. Something. No one was waiting for Something and no one remembers what happened earlier nor what happened later, but what after a moment became Something at that particular moment found that everything else is not Something but Something Else. 3. Else. We can assume now that Something happened at the same moment as Something Else, because at that particular moment when Something happened, everything else was not already a part of Something, but became Something Else. 4. Thought. The thought that there is Something Else was the very first thought of Something. In fact, how was it possible to think about Something Else being at the same time Something Else? At that moment Something already was not Something Else. Something was Something and Something Else was already Something Else. 5. Difference. The difference between Something and Something Else right after they both happened was big, huge, and enormous. That difference was bigger than anything else at that time, mainly because it was the only difference that was there. Something found that difference as soon as happened, but because except Something and Something Else there was nothing, there was nothing to compare that difference with. There was also nothing to compare with Something and nothing to compare with Something Else, except compare them one to another. 6. Comparison. Indeed, the only things that were comparable at that moment were Something and Something Else. As we can think about it now, at that time for Something, Something Else was the only thing that was there and the only thing to compare with, but compare what? Since nothing was there except Something and Something else, there was nothing else to compare. 7. Drive. As soon Something happened he was very curious about everything and wanted to understand as much as he could. Because except Something and Something Else there was nothing rather than difference between Something and Something Else, Something decided to focus his curiosity on that difference as it was the only difference that was available. He wanted to understand how much Something had from Something Else and how much Something Else had from Something. Why? May be because something always need to be done and that was the only action that could be done at that moment. That was the only option of action for Something, action to prove a simple fact of his existence, and to prove that Something is Something! That was a second and very pleasant thought of Something, but that was the time to act. 8. Action. After his first exciting thoughts Something decided to understand Something Else and immediately found that Something Else can be divided on multiple parts. Something Else can be divided multiple times on multiple parts of Something Else. Something found that in himself there are also many parts that look quite similar to the parts of Something Else and was confused about it. It was hard to believe that Something can be Something Else and Something Else can be Something! This discovery made that big difference between Something and Something Else much smaller than it was before and, then, this difference was already never that big like it was at the beginning. 9. Result. Something found the process of dividing Something Else into smaller and smaller pieces was interesting because to find at the very least something, by doing what Something was doing at that moment was already kind special. Something spent long time dividing Something Else into multiple parts and comparing these parts with each other, and with parts that Something still considered as himself. As long as Something was studying Something Else by dividing and comparing parts of Something Else, the more unlimited became Something Else and less remained from Something. That process though was still interesting and it was taking all of the time and efforts of Something. In fact there was nothing else to do at that moment except of what Something was doing. 10. Order. With time Something found that after dividing Something Else into multiple parts it was much easier to move these parts and rearrange them into new different orders. Something learned fast how to move different parts of Something Else from place to place and how to put these different parts of Something Else in newer and newer orders. That was even more exciting and Something really enjoyed doing that and did it for a long time. Why? Probably because each time when Something put all these parts of Something Else into a new structure that newly ordered structure of Something Else was the only thing that could come from Something. This in turn proved that Something is really Something! 11. Voice. Each new structure that Something had created from pieces of Something Else was only a small change that little Something made in a big and obviously unlimited Something Else and that was the only proof that Something was something real. It was also a good proof that little Something could dominate over big Something Else. In fact, Something Else never did anything like that to Something, anything like what Something now was able to do with Something Else. Something was very excited to realize that fact and to understand his power to change Something Else. Then, Something for first time very unexpectedly expressed his great excitement in a new for him and quite strange way. Something said “WWAAUU”. 12. Reflection. Something did not understand what exactly happened right after that, but he realized that immediately after he expressed his excitement that excitement came back. Something understood that he was able to get a reflection of himself in Something Else and that was a new experience. Something tried to repeat it and, then, he started to repeat and repeat the same thing multiple times. That was the first direct interaction between Something and Something Else, although, in fact, except the reflection of his own excitement Something got nothing else. Each time Something was saying “WWAAUU” that action was coming back as a consequence of other actions that made no clear sense to Something but clearly appeared as his reflection. Then, when Something did what he already did for quite a long time, he found that big Something Else had changed and what was obvious that Something Else had changed because of Something was doing. For example simply saying “WWAAUU” multiple times produced a different response than if he said “WWAAUU” once. Something already knew that he was able to control Something Else, control something that was around and that was the most pleasant thought of Something but that was also a time to move. 13. Move. Soon, something found that a very similar manipulation just like he had done with Something Else, dividing it in multiple parts, could also be done with himself, with these parts that Something considered as himself. Something realized that he himself could also be divided into many parts and these parts could also be rearranged into a different order similar to what Something did with the parts of Something Else. Not all of them, though, only some, otherwise Something became Something Else. Something understood that very fast and that was a very unpleasant experience. 14. Connection. Soon Something found an interesting thing. Some parts of Something were at the same time the parts of Something Else as well and these were very strange parts. These parts were always in between of Something and Something Else. They were always coming out of Something, but a moment later they became Something Else. Something was trying to understand these strange parts. Just a moment ago they were part of Something and, then, they are Something Else! That was a clear connection between little Something and enormous Something Else. Something was enjoying playing with these parts and felt that these parts could make a complete unity between Something and Something Else and, thus, unity with the initial Everything and may be even the original Nothing. However, at that time Something did not think that far ahead. 15. Private. After Something found that there was a “connection” between Something and Something else, Something immediately started to investigate the parts of himself that were producing these strange parts that after a moment become Something else. These parts, however, never turned into the Something Else and were always Something. Something was trying very hard to understand the difference between them. He was pulling these parts toward Something Else and did many other things to understand them better, but whatever he did with these parts, they were always remained with Something. These parts were different from all of the other parts of Something, the only parts that were taking a part from Something and giving that part to Something Else. These strange parts provided “connection”. Something immediately concluded that these are very important parts of himself. 16. Pain. Time was passing fast and Something was consistently finding out many new things about Something Else and about himself. Too many new things that had already been systemized and rearranged by Something in many different ways. They all raised one question: “How deep can Something divide himself into how many parts, yet remain at the same time Something?” On one side the answer was obvious that except the parts that provided connection with Something Else, all other parts cannot be separated and always were with Something. All attempts to separate other parts were not successful. Every time during these attempts Something felt like he was turning into Something Else. It was clear that Something could not feel good without parts of himself except the parts that were in between. All these feelings have been summarized by a simple meaning of “pain” which Something did not like. On the other side, Something knew that being Something, he still consisted of multiple parts, just like Something Else and that these parts could be rearranged like in Something Else and a new order of these parts can give Something something new. Something had already learned that parts are more limited than their order and making a new order from the parts is what Something did pretty well. The only thing that was not clear to Something was how to get a new order of his own parts and still remain Something? 17. Reorder. Something started to learn how to move parts inside of himself and how to make a new order from these parts similar to what he did with Something Else. That was not easy at first run. That was much harder compared to what he did to Something Else, but step-by-step Something found how to compare different parts on himself and how to put them into a new structure without changing the general consistency of Something. Although, not any of the new structures inside of Something were stable and strong enough to stay for long. Over time Something tested almost all of the available to him combinations and learned how and what to do to rearrange himself and keep control over each of new orders inside of him. That was long and hard work, but finally Something had learned how to do that and he did that as great as many others around him. 18. Others. It was very unexpected, but Something found that there are many other Somethings around. Somethings that just a time ago were a big solid Something Else now became many different Somethings. It is hard to say why and how that happened, but by somehow other Somethings found a way to convince Something that they are also Somethings, that they are just the same and have nothing to do with Something Else. Indeed, they made Something believe that they just the same, just like Something. 19. Trick. After a while Something realized that other Somethings who were able to convince him that they are also Somethings, did it to him because they knew a trick. They allowed Something to use some parts of Something Else that our Something was not able to get without them and that Something was badly needed. Something needed these parts of Something Else to consider himself as a Something, and to be even better Something than many other Somethings around. That was not fair no doubt! That was absolutely against everything that was there by that time and that was the very disappointing thought of Something. Something had a strong feeling that Something Else was trying to sell some parts of itself, so Something would admit that Something Else is in fact Something. Something thought that all these Somethings around were trying to trick him. That was wrong, how could they do it to him! Something Else was Something Else and was actually already under the control of Something. How could Something Else trick him after that? Something knew how to split Something Else in parts, knew how to move these parts and how to make new structures that would not exist without Something. Something Else was already nothing without Something, so how could that would be possible? The fact that it was possible was his reality even that was so wrong! 20. Cooperation. Something was not able to understand how it was possible to consider Something Else as Something, but Something was badly needed these new parts of Something Else that he did not have. Something also felt that by doing all of the previous things with Something Else, Something got way too close to Something Else and everything had happened this way mainly because of close interaction between Something and Something Else. That was unfair, that was wrong, but that was a deal! Something admitted to considering some parts of Something Else as Something, to continue his way because there were no other ways clear for Something. Plus Something already learned how to use the trick that Something Else did to him to become Something. Now Something used the same trick with the other parts of Something Else that now have been already considered as Somethings. He used this trick to convince other Somethings to consider himself as very real and important to them Something. That was not that hard, that was like a game. 22. Learning. Something did ask and to his surprise he received many answers at the same moment. He received so many answers to one simple question that Something immediately decided to consider all these answers as a parts of Something Else that also needed to be rearranged and regrouped just like everything else. That was a new way for Something to get more parts of Something Else. Something started to ask other Somethings many different questions and put their answers in order and he did this for a long time. Something finally found that it is not so bad to consider some parts of Something Else as Somethings since that way it was much easier to get many new parts of Something Else. Asking questions and getting answers was even more interesting than everything else that Something did so far. Sorry, I have to stop this story for a while and take a break, because I would not give too much attention to what happened after that until Something found the Best. Too many things happened and many things that Something had found. He found how to copy, how replicate, and how to find the things that were impossible to copy and to replicate. He found how to use force and how to fight. He found many friends and many enemies. Many things happened to Something and many things he found before he found the Best. 24. Best. By that time Something was already very comfortable with all other Somethings around him. This was already very usual for him to consider them as Somethings and not as a Something Else. As a matter of fact he thought about the difference between Something and Something Else less and less, but one day Something met another Something decided that this particular Something is the best of all other Somethings around him. 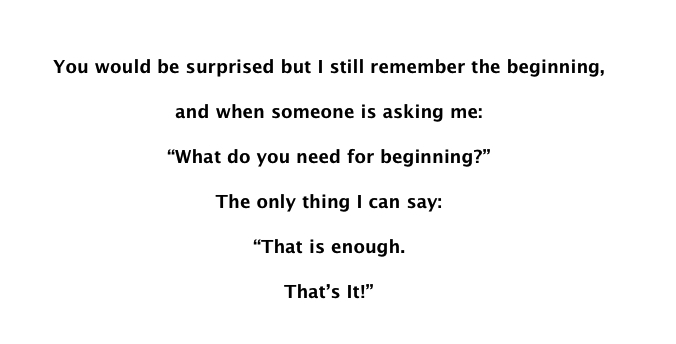 That was Something–Something and without it Something was not able to be Something anymore. Why? No one was able to explain that to him well. They all, all the other Somethings, just smiled and give him entirely illogical statements. By somehow that new Something, that had now become “Something-Something” at that moment, thought exactly the same way. Soon they both found a solution to stay together and to guarantee each other that they were both Something, or that it would be even more correct to say, that they both were Something-Something for each other. That was a new proof for both of them that they were still Something but not only that, they both thought that decision to stay together was the best decision that they ever made since the beginning. 25. Same. Surprisingly, but Somethings around were very happy about their decision. They all were happy to know that Something finally found in Something Else something very close, something very similar, something that at that time almost became the same as the Something that this story was actually started from. Both Somethings were very happy, although, they became at that point just like all other Somethings who are not able to separate Something from the Something Else and who do not see a big difference between these two things, but in fact, they both did not think at that time about Something Else anymore. Now they had Something Else in each other and were perfectly happy to think about something else. 26. Next. Something may live this way, just like all others Somethings did, live from that time and forever. It could be very possible that this would happen exactly this way if Something would not want to know what is Something if everything around him and actually inside is Something Else. Something knew by that time that everything that goes out of him becomes Something Else and everything that is deep inside of him, even his deep beliefs and deep feelings, all these things are also going to the outside to become Something Else. Something was not ready to accept the fact that Something Else is the only real thing. Something was not ready to accept that Something is not a Something even at that moment of his life everything was proving that simple and obvious to everyone, fact. Something knew that he is Something and that was so logically correct and unbeatable that even when everything was telling him that he is not Something anymore, but just like everyone else, still, something was not able to erase his last “a priori” privilege to be Something, and in fact, he is Something and he was Something from the very beginning. 27. Curse. Something started to think about Something and Something Else more and more often. During his usual routine these thoughts were happening unexpectedly and sometimes were even annoying. One time, during his usual obsession about inability to find Something in Something Else and about consistent changes in Something Else, Something suddenly realized that this goes in a circle. Something knew that he is participating in all these changes in Something Else and in fact he was playing a very active role in many of them, all his life he did many different things to turn Something into the Something Else. He realized how he was doing that, doing his usual work, sharing his experience with others, growing his family and pretty much everything what he was doing. Then suddenly both lines of his thoughts crossed each other and Something decided that there is no sense to put all his efforts on Something Else trying to find Something at the same time. Something decided to look at himself just like it was before, like it was at the beginning, and he surprisingly discovered that he already cannot find where is Something since everything and everywhere is in fact is Something Else. 28. Memories. Something made another attempt to recollect how it was at the very beginning, to recollect that there was Something at the very beginning when Something just happened and when the difference between Something and Something Else was enormous. Something was trying to recollect that time very hard, but was not able to recollect anything. That was very confusing to not find anything in his own mind since Something was so confident that he was Something. May be not now, may be not anymore, but at that special time, long time ago he definitely was Something! Unfortunately, Something had no memories about that time anymore. Then, Something decided to find an answer from other Somethings like he had done many times before, anytime when he had a question. If other Somethings have been able to convince him that they are also Something, they must have gone through the same path and may know what to do to be Something and not a Something Else. 29. Mastering. Something started to ask his question of the closest to him Somethings, and they immediately explained to him that the main reason of being Something is in accumulation of knowledge about Something Else and also the skills how to divide and move parts of Something Else. They said that it is the only way to get Something from enormous Something Else, to get pieces that you can keep and use. If you do it well, then what you do became Something. The way you divide and move Something Else is the only thing that we can call ‘Something’ they said. To do that well anyone has to master his knowledge and his skills and master them all the time. According to that, being Something means that we have to collect our knowledge about Something Else and master our skills to successfully manipulate with Something Else so later we can pass this knowledge to the others who will keep doing that thereafter. Collecting and mastering skills and knowledge is the main purpose of Something’s life. That is how this works, they said. All Somethings need Something Else and if you know Something Else and know how to get it and how to use it, then, you’ll be strong, desired, and safe for your lifetime. 30. Idea. That was pretty clear. That was so obviously right and definite that Something did not put this opinion under any concerns because all other Somethings around him were always talking about that way of mastering and were always living that way and were growing other Somethings that way. That was the only possible way to live for the most Somethings that Something met by that time. They all have been like that! All experience that Something had by that time was telling him that this is the only way that works for everyone he knew. For everyone else but not for him. 31. Problem. There was one problem that Something was concerned about. Going the way that everyone else went around him, Something was supposed to accept the only one power, the ultimate power of Something Else and final dominance of Something Else over Something. That way nothing else had any sense except of Something Else. That way knowledge of Something Else and skills to divide Something Else into pieces and to move the pieces turning you into just a part of Something Else. Something already knew that going that way he would not be able to understand Something Else since Something Else is almost infinite and to go to the very end of the Something Else and remain Something is very doubtable if not impossible. 32. Amount. The world of Somethings was not limited by those who were living just around him. Some other Somethings actually were telling that there are no need in knowledge of Something Else and also there is no need in skills as well if you know what makes a real sense in this world. Even if you will know extremely well Something Else, all your knowledge and skills are still important only in case if you have other Somethings around you to sell it to them. They said that there are no reasons to run for your own quality mastering your skills rather it is much smarter to get maximum quantity of Something Else. That is the only thing that has sense, they said. Sense that know all Somethings around, sense of Something Else, because the quantity of Something Else is the ultimate criteria of its quality. In fact, only Something Else has sense and there is nothing valuable in this world except that. That was clear and had perfect sense. Something knew that this sense was absolute and unchangeable as soon as it comes to any Somethings who judge everything in relation to the others. That was clear but not convincing to Something either. Ultimately, new Somethings also suggested to take a side of Something Else and completely forget initial Something that Something wanted to find. Something decided to go away and talk to the others. Talk to these who were criticized by all believers of Something Else no matter what they have been looking in Something Else, its quality or quantity. 33. Opposite. It was not hard to find some Somethings that were criticized by all Somethings he met before. No matter what they believed in, they were in agreement that these strangers are looking for something that actually is not real, for something that doesn’t exist and cannot exist at all. They were saying about them “How can they even talk about “That”, how they can even believe that “That” can exist if everything inside and outside of us is just Something Else?” That was enough for Something to go and find the believers of “That” and ask them his question. 34. That. Believers of “That” were living very close and were talking loud about their beliefs. They immediately explained that “That” is an absolute and what we all have to do is to follow “That”, follow “That rule” follow “That direction”, follow “That path”, and simply follow “That”! We have to follow “That”, that is simple! – they said. We have to follow “That” to discover “Him”. Discovering “Him” we can save our own “Something” that is infinite and virtually indestructible, but it became infinite only if you follow “Him” and believe in “Him” with all your heart. It was not completely clear how “That” is different from Something Else and it was quite confusing why it was so important to find “Him” and it was totally unclear who is “He”. It was even more confusing that all believers of “That” in fact were talking only about “Him”. Even Something was trying to find himself and was asking about Something everyone from his new friends, they all were talking only about “Him” and not about Something. Soon Something realized that “Him” was an “escape” for these who are trying to find Something, but do not know what to do and may be already do not know what is Something is? 35. Neither. Something also heard about others who were not like everyone else he met before. Both believers of Something Else and believers of “That” were criticizing those whom Something never saw. Some criticized them for denial of Something Else, others for denial of “That” and unbelief in “Him”. That was enough for Something to find them and ask what do they think about Something and Something Else. Would they be able to find the only possible and infinite Something that our Something was a time ago? It took some time to get close to new Somethings. They did not live as close as, they did not insist on truth of what they believe in, and they did not say that they believe at all, they just live where they live with these who like to live that way. New Something explained that there is no Something and there is no Something Else and of course there is no such thing as “That” or “Him”. They said that all these concepts are just miseries of our mind that is trying to fix itself on Something Else to feel safe and protected and that feeling is also a big misery. They said that everything is happening in this world because of continual interaction of two matters and if some one would like to call it “Something” and “Something Else” that is fine. The interaction of these basic matters gives the beginning to the everything that exists and can exit. They explained that Something and Something Else could not be separated and cannot be understood one without another. Because of these two matters – Something and Something Else, any Something is always tearing by continuous fight between “Something” and “Something Else”. That new idea was very close to what Something was thinking for a long time. After learning more about new place and new Somethings, he decided to stay with them longer. 37. Time. Something was staying close to his new friends to understand everything they knew and to learn the path they chose to solve their questions. Something learned how to solve most of these contra-versions and how to eliminate both or the matters from his mind, the matter of the Something and the matter of Something Else. Since each of them is not real without another, since they both go together and both have the only one purpose – to fight and to guarantee each other “feeling of life”. The force that moves them around each other, that force of fight, is the only force that makes things real and the only way how things can stay alive. Because of that all things can stay alive and all things have to die at certain time. This force stays in between Something and Something Else and cannot be defined without them. Something knew that and he already knew that there is no cure for life. He knew that his way would not solve the misery of suffering or dying. It will not solve the misery of living and fighting either. Something understood soon that new concept of living was not a cure and could be another escape. When he asked this question his new friends they said that all his concerns, all his thoughts are the consequence of misery and can be released only by elimination of both components. Elimination of Something and elimination of Something Else. He replied: “That is also escape! How you do not see that?”, and even they were saying that you cannot change the consequence of things that made you alive, Something still started to put under concern whatever they are said. Still, he was trying to understand them and learn from them. 38. Path. There were a few things he had to accomplish according to his new teachers. First, was to eliminate Something Else. For that they suggested he follow many rules starting with the rejecting of any part of Something Else and anything that had any value to anyone else, anything that could be considered valuable by anyone must be eliminated first. According to these rules you have to eliminate all Something Else from your pockets, from your body, and from your thoughts. In other words you must have no money, no sources, minimal support for your body, and minimal wonder in your mind about what you are doing. Going inside of Something deeper and deeper, eliminating of all Something Else, finally, you will see that the only way that will lead you to the Something is your own way to yourself. Then you will see “It”. “It” is not Something”, they said. It is impossible to say what is “It” until you see “It”. One just can say that “It” is initial Something that still exists, but in fact you do not need anything else to explain “It”. Others can say that “It” is the in between of Something and Something Else, which gives the origin of Something and Something Else and Everything, but in fact these are too many words to explain simple “It”. They said, “You just have to follow the path to get “It”. 39. Tacit. That was not easy to understand the whole idea of “It”. Something felt that “It” was not something that is understandable at all, but it was even harder to practice the elimination of all of Something Else from his life and even more harder “to not think about “It”. That took him long time to go through all of the steps, but finally that worked well. Finally that just worked, like everything else in his life before. Finally “It” became clear because nothing else can be said about “It” after all. Nothing can be said about “It” at all! He understood it even it took him a long time to get such a simple thing. By that time when Something got clarity in elimination of all things that interfered with his thoughts it was not already elimination but a release. His new freedom put Something far away out from his thinking and not thinking, from acting and not acting, and from many other things inside and around him. By that time Something in fact started to feel something that can be very different from anything else he knew before. He started to think that his new feeling could be “It” and no matter what that feeling was that was great! That was a feeling of Everything with no limits with no divisions on Something and Something Else, with no knowledge and no skills, with no rules and with no obstacles, but with all of them in the same time and with no time. 40. That is It. The only thing that was not clear at that end is that “It” is supposed to also be rejected, completely refused as soon as “It” was found. According to what others were telling, Something is supposed to reject that initial and final “It”, that great wonderful feeling that he just got. Feeling that is in between and that is giving life to everything, that is giving Something and Something Else. “It is supposed to be also eliminated as well as everything else” – they said. You have to reject “It” to eliminate the possibility of future fighting with yourself, future miseries, future sorrow, any future questions, and even the possibility of future itself. Something knew that, he was told about that “final rejection” many times before, but only now it became clear to him what exactly he suppose to reject. Only now he understood what “It” is and immediately got himself in a trap saying that it is impossible to refuse anything since nothing else exists anymore except “It”. That was logically correct and unbeatable, but the only thing he knew at that point that he has to reject “It” but he could not, that it was a “trap”, trap because Something Else was still there as well as a difference between Something and Something Else and that was his misery and his desire to stay with “It”. 41. Rejection. Something knew that if Something exists, then, there is Something Else and even if he will escape from Something Else for awhile using any rules, any tricks, or any other ways, Something Else will come back sooner or later and it is going to be a fight and misery and sorrow again. Something supposed to reject “It” and everything that is inside of “It”. Reject what he was just found completely, reject everything that he had. Based on what others said, after that rejection Something will find something that actually can not be called Something anymore, but Something that is initial and undividable, Something that at the same time can not be initial because it did not initiate anything and can not be divided and defined because it does not exist, Something that has no sense to be discussed or considered, because it cannot be even considered as a something that has sense. Even if someone can say that this exists “in between” it is not even there, since if you are there, and there is nothing else even in between. Sounds like nothing, but in fact something was still there just like you and me. 42. At the end. That was a problem. A similar problem Something was faced with before. Something was not able to reject “It” even when he was trying hard, he did not reject “It”. He was not able to make it. He said to himself that he will stay with “It”. “It” was at the beginning even before Something has happened and even it can be true and Something Else can be a part of “It” and both of them are suppose to fight and produce misery and everything else, that was not what Something knew by his heart. He was with “It” and he knew that “It” is different. At the beginning Something was not “It” and was not Something Else and even before that was something different, Something did not want to go there, to go before Something has happened, because it is not the right place to find himself simply because he never was there. In fact, how can you find yourself somewhere that is before you have happened? 43. Unreachable. It supposed to be another place and another way and Something was positive that he can find that way and can find that new place. During his practicing of elimination of Something Else, Something heard about others who decided to stay with “It” and still escape from the misery at the same time by consistent movements from Something to the Something Else and back and so on, staying with “It” but not rejecting “It”. They did it by practicing a quick almost unrecognizable by others jumps from Something to the Something Else, so they have been able to stay everywhere. They did not say that they are staying with “It” but were saying that they are staying in between. Everyone who knew about them call them “Unreachable” maybe because of their quick jumps or maybe because of a problem finding them. In fact, finding them was a big problem. Something did not know where to look for them neither anyone else who told him about them knew that. Find “Unreachable” was very hard and that was even harder to understand “Unreachable” after Something finally met them. Whatever they were saying had no sense to him and they actually were saying that there is no sense in saying anything, and even if there is some sense in actions there is even more sense in staying in between of the actions. What they were saying was hard to follow. Their thoughts were unclear to Something especially after being between Something and Something Else for such a long. 44. Edge. What happened next was not just a pain that was on the edge of everything and nothing. All the actions that Unreachable consistently performed by themselves and now asked to perform Something, all these things where in between. In between of pain and final absolute feeling with no pain, in between of extremely sharp feeling of life and final feeling of nothing. Everything he did now was on the edge and was in between. Surprisingly, that did work well just like everything else before in his life and even faster. His new experience came to him much faster then most of knowledge he was learning earlier. Something did understand now, he felt, and he clearly knew what it does mean to stay in between. 45. State. That was a state of life that is hard to step in and even harder to leave. That was not something that is possible to stay with if you want to do something else except being in that state. That was the end of doing anything and that was everything at the same moment. Something Else was not a question anymore. As you may have noticed Something Else was not a question already for a while even if it was so important at the beginning. Something else was not matter anymore and Something realized it only now, even though he did not think about Something Else for a long time. Something Else was already here with him and because of him, because of Something. That was it or that would be it if Something would not want to have Something Else, have just something else, something extra that still may happen in his life. 46. Still. He was not able accept the fact that that is it. He still wanted to have something else. Although, Something was pretty much everywhere by that time and pretty much everything, not Something Else, not It, not That, not Everything Else, not even Something, but Everything. He did not know who is he and where is he and what will be next but he knew that everything is here already no matter what will happened. Something knew that he is here now. Here where everything else, everything including him, you, and me. Something did not see that state as an end, he did not see it as his end. He still considered something else on that way and that was the beginning. 47. Happened. Beginning is generally a very strange thing because to reach the very beginning is almost impossible as it is impossible to reach the very end. Even now when it is clear what was before the Beginning it is obvious that even if you know what was before it doesn’t really matter for what will be the next. What was before does not matter at all if you are staying at the beginning. That is your beginning, beginning of something new! Something that still may happen and, Something happened and that was the Beginning. 48. Something and Something Else. Something has happened somehow by himself and it is very hard to say what has happened earlier what later but what after a moment became Something at the same particular moment decided that everything else is not Something but Something Else. 49. Untouchable. Something has happened again and everything else became Something Else and just like before it was impossible to say where is Something and where is Something Else, where is Beginning and where is the End. These whom Something knew as Unreachable told him that there is only one being beyond “staying in between” behind “Unreachable”. They called that state “Untouchable”, and Something knew now what that means.